Named the #1 Family Resort in the United States by Travel + Leisure Family, Palmetto Dunes Oceanfront Resort offers Hilton Head Island’s ultimate vacation experience. With three championship golf courses, 3 miles of South Carolina beaches, 25 tennis courts, bike rentals, surf camps and much more, there is something for everyone to enjoy. 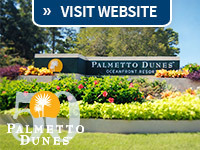 Call 888-322-9091 or book online at Palmettodunes.com. Hilton Head resorts are truly legendary. With white sand beaches, spas, golf, tennis, fishing, kayaking and more, you’ll enjoy the best of Hilton Head Island when you stay at a resort. Enjoy a taste of paradise on Hilton Head Island, whether you are planning a vacation, wedding, reunion, business meeting or conference. Hilton Head vacation packages are available year-round, providing an ideal opportunity to experience the best of Lowcountry living.